I just returned from a 2-day visit to the Itoshiro river, one of the only catch-and-release streams in Japan. This was my second visit to an annual gathering celebrating the success story behind the Itoshiro, where the fish are abundant and no fish have been planted in over 8 years. In the past this had been an event with the presence of tenkara anglers, as well as fly-fishermen and lure fishermen. Tenkara anglers have normally been the majority at the event. This year, due to the eartquake and tsunami disaster, the fly-fishermen decided to cancel their participation in honor of the victims. The tenkara anglers pushed forward and decided to make it into a fundraising event to help the victims of the earthquake, so it was a tenkara-only event this time. I’m very glad the event was still held, as we were able to raise money for the victims while appreciating the connection we all have with one another. It was a most enjoyable trip. 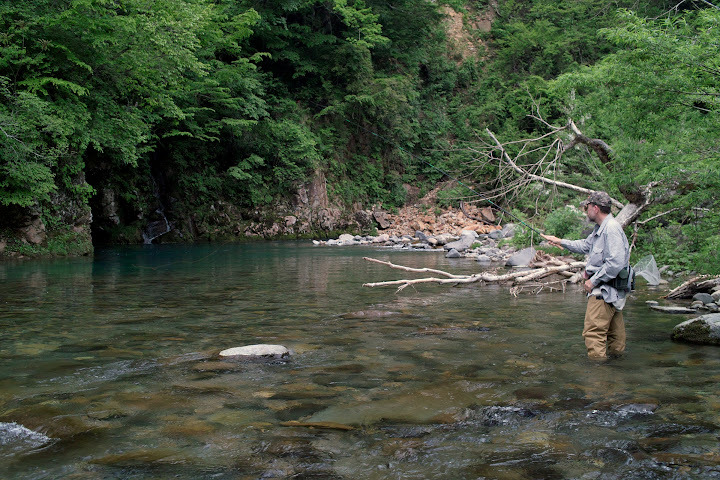 This year I was joined by Chris Stewart, the Tenkara Bum, who came to Japan on his first visit. I picked Chris up at the station near my village on Friday and we drove 2 hours to our destination. We arrived just in time to see Dr. Ishigaki taking his first steps from his car to the stream, and so we joined him for a bit over an hour of evening fishing. The hatch was strong, and fishing relatively productive for such a short period. I did hook the most, 6 fish that evening, choosing to move very fast and fish the most obvious pools only, since we only had a short period of time. During the event I was very happy to see and fish with several people I had met last year, and was also very happy to meet new people. Among them was Takashi Yoshida (above) who drove about 7 hours for the event and entertained us with a wonderful fly-tying demonstration. While tenkara flies are traditionally simple and most tenkara fishermen keep their flies very simple, Yoshida-san has been pushing the boundaries by using techniques and materials that make him stand out as a fly-tying innovator. 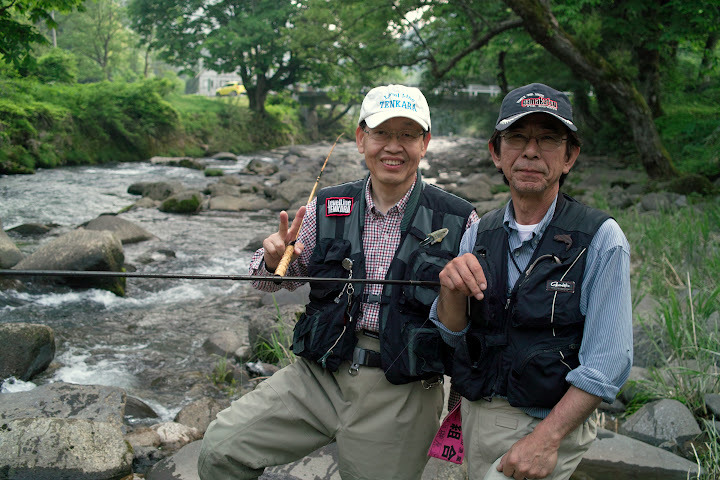 He’s quite an accomplished tenkara angler, and while trout streams may be his favorite, Yoshida-san has been one of the people who has been pushing outside its traditions. I was happy to meet him, as I had seen a video of him teaching tenkara shortly before I came to Japan. After his fly-tying demonstration Yoshida-san and I fished together. Yoshida-san fished very heavily pressured waters near Tokyo, and he’s been open to using different approaches to get into fish. While most tenkara anglers I have met stick with more traditional patterns, Yoshida-san doesn’t think twice before putting a beadhead nymph if he feels that will catch fish. He also teaches students with PVC western fly-lines which are very easy to see and cast, though he admits they are not ideal for most tenkara situations. Here’s his video, and here’s his blog. Last year I was presented with two tenkara bamboo rods made by Dr. Ichihashi, a pediatrician whose passion is bamboo rod making. This year we were fortunate to be offered a workshop on tenkara bamboo rod making. Those who still think tenkara is cane-pole fishing, I can tell you a couple of things: tenkara is neither fished like your childhood cane-pole, nor are the cane rods the same. There is a lot of craftsmanship that goes into tenkara bamboo rod making and he showed us just a preview of that. After his workshop on bamboo rod making, I was able to fish once again with Sakakibara Masami (featured in our video “Tenkara Masters” shot at last year’s event). Once again he was able to teach me a couple of new things. On Saturday evening I fished with Sakakibara-sensei, his wife, and Dr. Ichihashi who, of course, was fishing a bamboo tenkara rod. On Sunday morning Chris and I headed to the main part of the Itoshiro, but quite far upstream. This area was not a catch-and-release area, and so I’ll blame our slow fishing morning on that fact. The water was absolutely beautiful and we did hook a couple of fish each. It was nice to fish with him on a Japanese river, I almost thought we wouldn’t get a chance to do it again. And, of course, I spent a great deal of time talking and fishing with my sensei, Dr. Hisao Ishigaki. 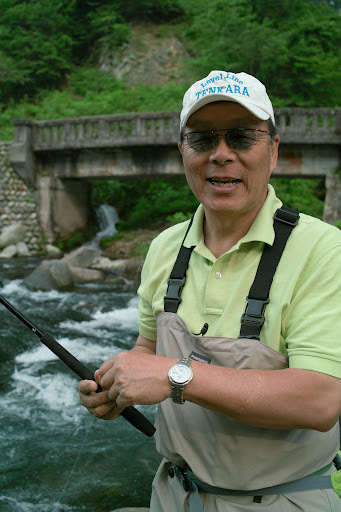 Dr. Ishigaki, 64, is regarded by most people as the person who’s popularized tenkara as a sport in Japan. He taught a class on Saturday and was busy coordinating the event. Once the event was over, we headed to a place a bit off-the-beaten-path with Chris and one of Dr. Ishigaki’s students (Dr. Ishigaki is a professor in the field of “vision studies”, nothing related to fishing, he primarily teaches how the eyes work and perceive things, and works a lot with athletes and in the sports industry… he recruits a lot of his university’s students to tenkara). I talked to him about a few things I learned from other people and as always he had excellent arguments against certain theories, or excellent explanations to support other theories. I’m happy to have him as my sensei and for his continued support and teachings. She notes “Chari-ten” is the short form of “Charity Tenkara” – a good term to remember. Thanks for the bit about Dr. Ichihashi. I’ve sometimes seen him briefly in videos or still pics on web sites, always with bamboo rods. I’ve often wondered what the story is behind him. Did he collect old rods or build new ones? Now I know. I think there is a small initial push to attract women to fishing in Japan, or perhaps just to attract women with the intent of getting more males into fishing. Not sure they are teenagers in the video as they usually look younger in Japan. There is increased adoption by women and now there are also the terms “kawa garu” and “yama garu” – river girl and mountain girl, respectively. Hi Daniel, looks like the trip is a great time! Is there any way you can get any info on tying flies on eyeless hooks and also how they rig them up to fish with? It looks very interesting. – you can adjust the size of the eye as you wish. – there is less of a shock on the hard metal, thus preventing tippet breakage. – eyeless hooks are easier to find here – yes, they are. What a beautiful group photo! I see you at the end and I think Chris right in the middle. It’s great to see all generations representated – kids along with the older teachers. Tenkara definitely has a future. So glad Chris got to be there. 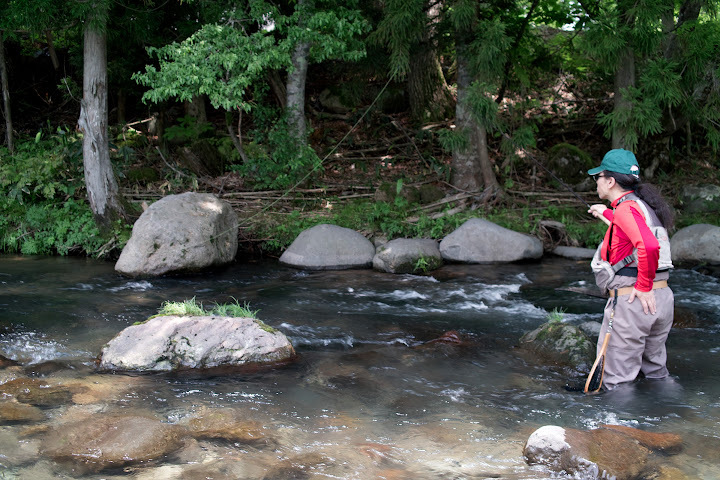 Fishing tenkara together in Japan must be a whole ‘nother experience! Things are temporary, but I hope you get to toast the event with sake from local guimono and savor it right through to the core.